For the adventurous, the Reactional Sectional in Fandago Flame Orange is a bold choice. Paired with these pillows that help incorporate some neutral tones, you can add this sectional to your room with ease. If you're not quite in love with the bold hues all over the Avery Sofa Chaise may be perfect for you! With an overall basecloth in a neutral tone, the pillows incorporate a slew of bright spring hues and a fun pop of green accent! For a fresh complete room, the Raphael Sofa and the Enlighten Settee are a perfect set to balance each other out. With fun yellow hues, choose a simple yellow vase and some fresh blooms to brighten up your room and truly bring the spring flowers indoors. 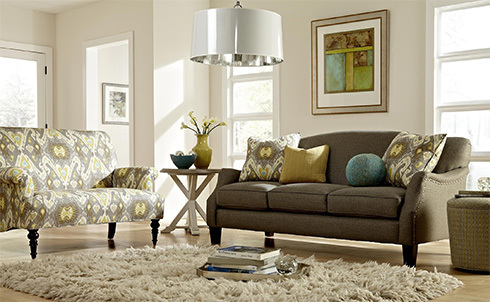 For a more permanent enhancement for your room try a bold spring inspired paint color. The Olivia Sofa looks perfect paired with these watercolor floral pillows - the green paint color is pulled directly from the bold green in the pillows' pattern. Let nature inspire you and freshen up your living rooms beyond the beautiful views outside your windows. For more fresh inspiration, visit Belfort Furniture's showrooms in Sterling, Virginia for an experience like none other. With over 100,000 square feet of showroom space, there's plenty to inspire you.